District Conference is coming up and there is a call out for people to host international delegates. 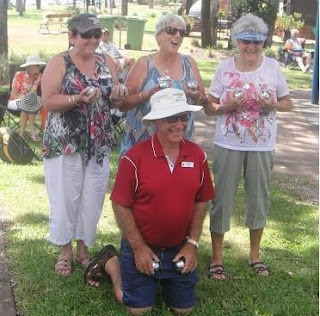 Judy and Helen were then pleased to induct Linda Feltman into the Rotary Club of Caloundra. Linda grew up on a cattle station near Rockhampton with her high flying father a MLA. The rest of her family - husband Ray and children Josie & Trent are all actual high flyers with QANTAS. Linda is starting with McGrath Real Estate. John introduced Howard who is well known to us all as the Community Liaison Officer for Caloundra Bunnings. Howard came to Australia at 17, returned to the UK and worked on cruise ships, then returned to Aus to work for engineering companies Email/Westinghouse, GC and HPM Industries. Fast forward to 2006 and he came back from Dubai to work as a builder and certifier in Adelaide. Looking for a simpler life, he came to the Coast for “a couple of months” but 18 months later he was approached by Bunnings. Bunnings/Westfarmers is the number seven company in Australia with a $60b turnover. Enterprises under the umbrella were listed including Coles & Target. They just spent $750m to buy the 260 store Homebase hardware chain in the UK. 1994 - bought out by Westfarmers - “Big Box” hardware introduced. Now the largest private employer in Australia. All employees are shareholders. It is “gender diversified” with 57% women. Howard says he “loves to be controlled by women” (but he may not have seen Helen checking her bag for a handy whip). Bunnings now has 290 locations in Australia. Marketing focusses on “lowest prices, greatest range & best service”. Expect to see another 20 stores in the next three years including Nambour, Beerwah & Kawana.